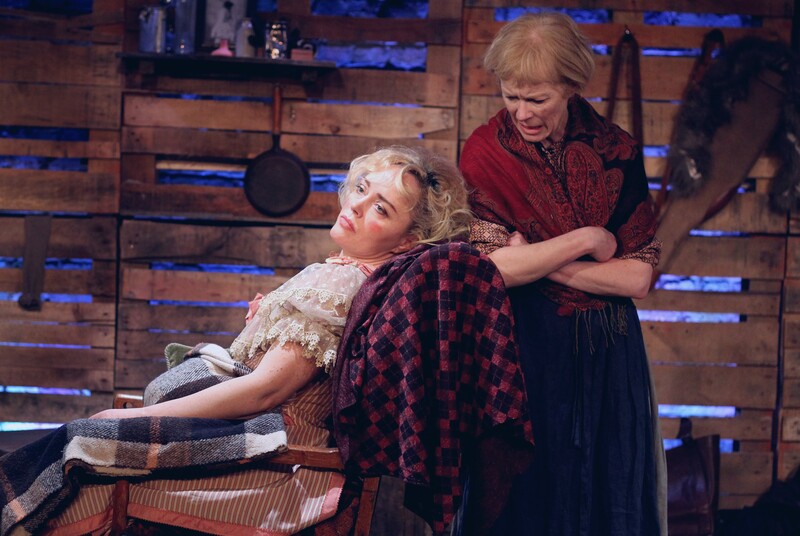 In Skagway, currently playing in Studio 2 at the Arcola Theatre, is a play bearing all the hallmarks of anexuberant writer finding their feet – and carries along with it both the positives and negatives that such a statement may suggest. Karen Ardiff’s play has won the Stewart Parker/BBC Radio Drama award. This is a telling achievement as there are moments watching In Skagway that one feels that radio, where it relies on a person’s imagination to recreate the last embers of the Alaskian gold rush ahead of the encroaching Alaskan winter, is the perfect medium for this story. Through the heart of this play runs a fabulously well thought out parallel; Frankie Harmon (Angeline Ball) plays an actress whose heyday has passed and is now immobile after what appears to be a stroke, whilst the role for which she was most famous was that of Hermione in The Winter’s Tale – known primarily for the scene where, as a statue, she is eventually restored to life. This idea – of an actress incapable of action being feted for a role that relies on becoming unfrozen – is a neat conceit and a wonderful place to begin a story. 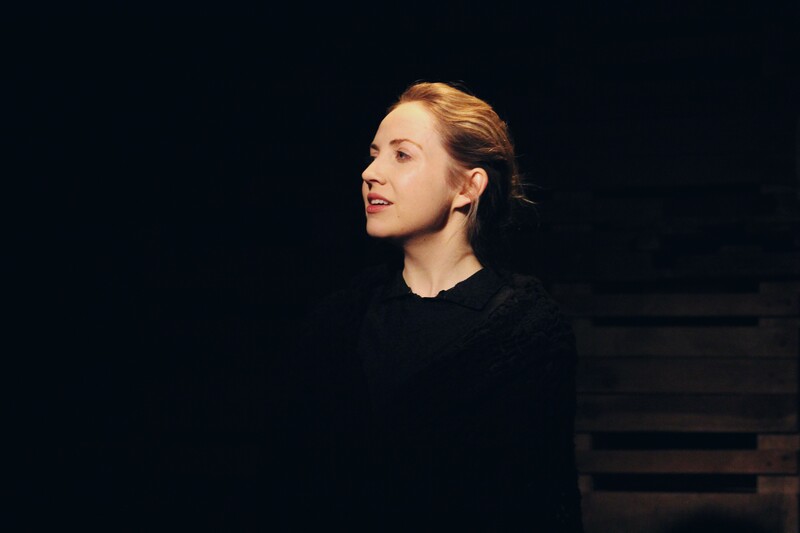 For the play to then be set in the face of the approaching harsh winter, as the gold that sustains the town begins to run out, (drawing on wider ideas of mobility and transition) suggests that Ardiff has a keen eye for creating a narrative that is able to fold back in on itself for dramatic effect. However at times the storytelling attempts to much and some of the themes risk falling into incoherence; a large proportion of the play was dedicated to Frankie’s backstory and it was not always entirely clear how this meshed with the central story. Throughout the play there were hints that she was difficult and manipulative but a revelatory twist revealed by May’s towards the end still appeared to come out of leftfield with very little foreshadowing. A secondary problem with placing so much emphasis on Frankie’s history was that it relied on a number of transitions to a rather ill-defined past. This is a shift that can work well on radio but in the theatre it did lead to a struggle to maintain fluidity and coherence. The final scenes, which operated with a voiceover, were more successful and mimic the radio experience more explicitly but those that were straight re-enactments were less successful and did jolt the audience out of the reality of the Alaskan cabin. Geraldine Alexander (May) and Kathy Rose O’Brien (T-Belle) did a fine job with their characters and the scenes towards the end, as they took their final look back towards the Alaskan town that was soon to become another footnote in the history of American gold rush, evoked a lyrical tenderness that hinted at a more poetic and reflective play lying under the surface. Ardiff has the qualities needed for good writing; she has a well-defined sense of place – Skagway itself is a fascinating and underdeveloped slice of history – and an astute eye for an interesting dramatic structure – layering the plot with intricate themes that faintly echo each other. That being said it does not come as a surprise to find that Ardiff is most well known as actor; much of In Skagway currently feels as if was written to be performed rather than written to be watched. To directly lift from a great writer, Kurt Vonnegut captured it best when he said ‘we have to be continually jumping off cliffs and developing our wings on the way down’ for how else do we learn?